After 20+ years of not really caring about Feature Animation, (itself rather odd considering who I married) I suddenly find myself deeply interested in a developing Disney movie. Bit of personal history here - 40 years ago I had a Red Fox for a pet for about 4 years. Thats not a story for now though. Well over a year ago Disney announced ZOOTOPIA. That far out there is virtually no information as nothing exists at that point except a basic outline of the plot and some very early character sketches, What got shown to the public was the one above. This is absolutely beautiful. What jumped right out at me was that Nick Wilde was an actual Fox. Everything is proportioned right. As someone with a Veterinary degree that meant a lot. And he looks perfect - sort of the sarcastic Attourney look. And while I'm not particularly interested in the rabbit (Apologies to D.G. if you actually read this) Judy Hopps looks fantastic in this picture too. Even the expressions on the characters couldn't be better. I was incredibly enthusiastic about this film, at this point still years away. But they couldn't leave well enough - or in this case perfect - alone. At some point later on - when the film actually got to the animation stage, another image appeared. Unlike the first one, this one looks like a piece of bad fan art from a not very talented fan. I dismissed it as such until I came across a version of it from what I'm guessing was the D23 convention. Its being presented to the public. I'll give them the benefit of the doubt here and try to assume that they realized at the last minute they didn't have any images for the presentation and someone unfamiliar with the characters had to whip this up, because it really looks god awful. Nick has gone from looking like Tom Cruize to Danny Devito, (whos already been an ugly Disney character). He looks seriously hostile and unappealing. Even *I* would have had a hard time liking him, and thats saying a LOT. The rabbit looks like a walker from 'Walking Dead" - entirely appropriate as her animator is a big fan of the show. But this isn't supposed to be a horror movie. And finally we have this. This is some dividing wall at the Burbank studio and not a published picture, but this has to be the final design. Its been cleaned up a bit so I could use it for an LJ icon, but the original source picture is here as the blue one on the left. Nick now looks like Robin Hood - except he has huge oversized 'Brer Fox" hands. Hopps looks about the same. 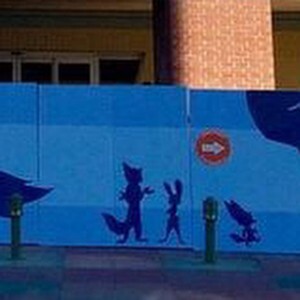 You can actually see ANOTHER fox character this one a Fennec. So far I know 2 voices and 3 character names. I actually know what a couple of the storyboards look like but I can't post those. I will say that Nick looks liek he is talking out of one side of his face most of the time. martes tells me that if the storyboards look liek this the animation will too - but I sure hope not.